Disrupt Battlefield alum HackerRank today announced that it has received a $7.5 million strategic investment from Recruit Holdings‘ HR Technology Fund for its hiring platform today. Recruit Holdings isn’t exactly a household name in the investment world, but the company is a major player in the information services and human resources ecosystem in Japan and currently has over 28,000 employees in Asia and North America. Indeed.com, one of the world’s largest job sites, is one of the company’s holdings in its broad portfolio of services. This new investment brings HackerRank’s total funding to $19.9 million. As HackerRank CEO Vivek Ravisankar told me, the team started talking to Recruit a few months ago and the company offered HackerRank very favorable investment terms. He also stressed that Recruit understand scale and will help the service expand in the Asia Pacific region, where HackerRank is already seeing some good traction. In the next few months, HackerRank plans to expand its operations in India. It currently has an office in Bangalore, but plans to expand to Mumbai, Delhi and other cities soon. The company also today launched DbRank, its new screening tool for hiring database programmers, business analysts and data scientists. The service is meant to help employers test the database skills of potential hires. It focuses on skills in handling Oracle, IBM DB2, MySQL and MSSQL. 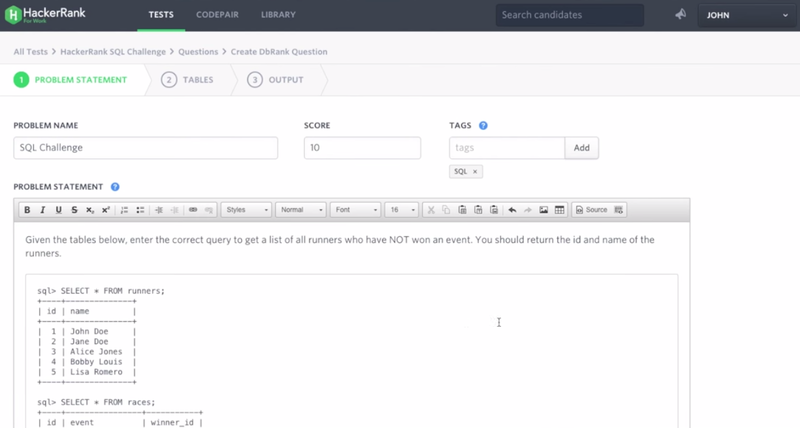 Candidates will run real-time database queries during the assessment process and the system will automatically score their performance. Support for NoSQL databases will likely follow soon. Since its Series B round last year, HackerRank has grown from 40 people to 125. To manage this growth from the HR side, the company recently hired Scott Gilfoil as its head of HR and talent. Guilfoil previously worked at the likes of Apple and Nortel, but his last role was as head of recruiting at Palantir.